The LG Artcool Mirror Wall Mounted Air Conditioning Unit model AC09BQ.NSJ rated at 2.5Kw is the latest version of the mirror wall mounted systems from LG that use the latest R32 refrigerant. This model is a full air source heat pump so can heat and also cool. Energy efficiency ratings on these new models are also improved compared to the older models with the use of the new R32 refrigerant. 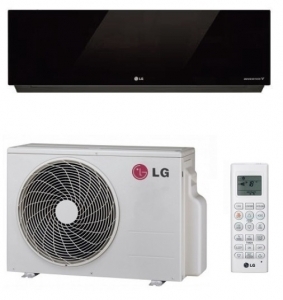 The indoor units in there sleek black format have features that include advanced plasma filtration and with built in wi-fi the ability to control the systems remotely via a smart phone via the downloadable LG app.